I have had my fair share of sibling rivalry. I grew up in a family of five children. Each one of us had his own way of making himself/herself noticed by our parents. For instance, our youngest, my brother, would always request for delicious food and drinks whenever he was sick, and my parents would often yield to his request. Being a child myself, I objected to this idea but never expressed what I felt. In my mind, I thought that showed favoritism. I never asked for anything special from my parents when I was sick, so I wasn’t given any. My jealousy was actually unfounded. Lol! I also knew that my siblings got slightly jealous of me because when my birthday arrived, my parents would have something special prepared for me. That’s because my birthday falls on a payday, January 31, so that means our father still had something to spare for me and nothing for them because their birthdays fall before or after payday. These true-to-life scenarios simply show that sibling rivalry is common in families with more than one child. To avoid jealousy among siblings, parents should assure each child that he/she is loved. The ways of showing love may vary, but the intensity and quality of love shown should be the same for each child. For instance, we can prepare an older child threatened with the arrival of a new baby by involving him/her in the welcoming of the newest addition in the family. We can provide big brother or big sister gifts for the older child to give to her younger brother or sister. This way, the older child doesn’t feel left out. How do you stop sibling rivalry in your home? 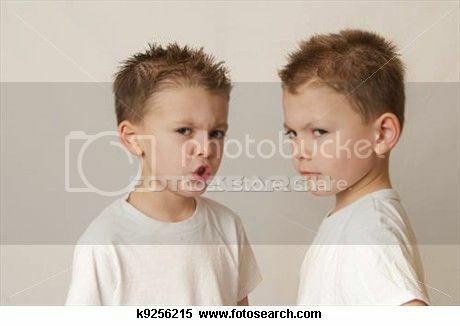 This entry was posted in Sibling Rivalry. Bookmark the permalink. Ah, sibling rivalry. Tell me about it. I have two other siblings and we practically killed each other when we were kids, lol. Things get better as we got older, thankfully. Haha! Sibling rivalry is a reality in every family that has more than one child. It arises even without intending to. Parents must really try to provide balanced attention so rivalry between children will not escalate to serious levels.